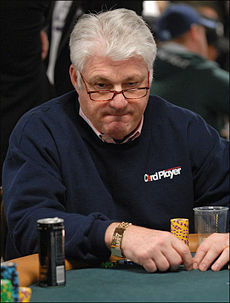 Barry Shulman wearing a CardPlayer Magazine shirt while playing in the World Series of Poker. Barry Shulman, the CEO of CardPlayer Magazine, is known less for his ability to play poker and more for the poker magazine he puts out. Barry Shulman’s poker magazine is loved and read avidly by millions of poker players around the world. Barry was born May 8, 1946 in Seattle, Washington. Barry began playing poker while he was in college. After 25 years of working in the real estate market, Barry Shulman moved to Las Vegas in the early 90s. In 1999, Barry bought CardPlayer Magazine using his retirement funds. Despite Barry lack of poker playing skills, he has won a single World Series of Poker bracelet, coming in 2001 in the $1,500 Seven Card Stud Hi-Lo Split 8 or Better event. Barry Shulman cashed at the World Series of Poker ten times, but has made one World Poker Tour final table. Barry Shulman finished fourth in that poker tournament, which went on to be won by Erick Lindgren. Barry also finished second in a Professional Poker Tour event. To date, Barry Shulman’s poker tournament winnings near $1.5 million dollars.